This was a request from one of our members. I wondered what the best method would be to do this, maybe using a 3 position 4 pole rotary switch, but I think this method by far gives you the most versatility. With both 3 position switches in the centre off position, the Meathead stock values (10n & 22n) will be in circuit. When selections are made, the selected cap value is summed with the stock value to give a wide variety of stock up to Meathead Dark tones. You will have 10n, 22n or 43n for the input switch, and 22n, 69n or 122n for the output switch. Swap the caps to suit your own tastes if you like things a bit more or a bit less dark. It may be worth building the board and then breadboarding the cap selection part to make it ideal for you. After a conversation below it and doing a few calculations, it seems that the change of output cap for the Meathead Dark was irrelevant as the frequency cut by the standard 22n output cap was already lower than the lowest frequency on the guitar. With that in mind, this version may be more useful offering a post gain bass cut. In the centre position with just the 220p in circuit it will be a very lo-fi effect because much of the mids and all the bass will be cut. In the 22n position you will get a full bass output, and in the 1n position there will be some bass cut which may be useful for cleaning things up a bit. Hello. I built that circuit but it only sounds clean signal? may be any error? What have i to do? Hi. Well this layout is definitely verified so there must be something else causing the problem here, so a few possibilities. When people have problems with Meatheads, a lot of the time it's to do with the transistor pinouts. What transistors have you used in there, and are you sure the base, collector and emitter are in the required locations? I have some of the BC range transistors with BCE pinouts, but I also have some with CBE so that is one possibility. Do you have the electrolytic caps in the correct orientation, negative should be at the lower leg in both cases. Are all the ground wires of the circuit connected together at a point of ground? Failing that, if you could take a high res pic of the front and rear of the board and give me links to the pics, I'll see if anything jumps out at me. Yes i have all correct. The first transistor is the same and the second i used BC182B cause the L they didn't have. The capacitor (-) is on the lowe position. I think all is correct. Hello man!! I changed the capacitors and now it works perfectly!! Thanks a lot!!! Excellent, glad you got it sorted. What do you think of it? I love the Meathead! I can't find a 12nf anywhere in the UK ... Patience has never been my strong point so is there any substitute that would stay close to the layout? Just use 10n mate. This is just to taste anyway so nothing is set in stone. Or if you want it a bit darker try 15n or 22n instead. Probs going to have a bash at this one next but just to clarify, can I just solder the Caps directly onto the two DPDT switches? I'm ordering parts for my first pedalbuild and I was wondering the same thing. But I think you indeed solder them directly onto the switch. Yes, just solder straight to the switch. I prefer doing that with diodes and cap switching because it's then a quick change, if you decide to experiment, to put in a new switch with different components and only have to desolder and resolder two lugs rather than having to remove the board and do the work there. Another question along these lines...with the switch with the pot, would one solder both the pot and the 220pf on the middle poles? It's wire from board to the switch lug 2 and that lug also to the other lead of 220pF. Then switch lug 4 to the other lead of 220pF and wire to pot lug 3. That way the middle (aka off) position of the switch has only 220pF in circuit. One more question, though: In either up or down position, does it put the selected capacitor in series with the middle cap? With a 3 position centre off switch, no contacts are made in the middle position, so the 220p is always in circuit no matter what. In the other positions, one puts the 22nF cap in parallel with it and so effectively making a 22.22nF cap, the other puts the 1nF in parallel with it making a 1.22nF. What kind of resistors did you use? When I compare this schematic to that of the Sonic Titan, I notice that this layout uses beige resistors, where the Sonic Titan uses blue ones. What kind to I order for the Meathead? Also metal film 1% 0,6w like the Sonic Titan, or something else? Hi Boost, I asked about Metal film and carbon film resistors on another thread so i'll paste Marks reply here, maybe that will help? This is one of those topics with strong views on both sides but I think I look at things in a more simplistic way. There is nothing unstable about carbon film resistors unless you expose them for a prolonged period to very high temperatures. Soldering isn't a problem but if you put a carbon film resistor in a multimeter to measure the resistance and hold a lighter underneath it you'll see the resistance start to fall after a few seconds as the resistor starts to break down. With true metal film this won't happen, the resistance should stay fairly stable (maybe rise slightly) for much longer. There are manufacturers in China who make blue carbon film resistors so this is a good check to see what you have received from some eBay sellers. Bear in mind that there are many vintage effects out there that still sound superb and people would pay top dollar for today, and many of them (in fact probably ALL of the really vintage ones) contain carbon film or carbon comp resistors that could be 40+ years old. It doesn't sound like stability is too much of an issue in the bigger picture of things. The real advantage that people pick up on about metal film resistors is their accuracy and there's no doubt that is true, you can buy a pack of 2500 1% metal film resistors from eBay for about £10 so if accuracy is the most important thing to you, then you don't need to break the bank to get it. My argument against accuracy against all else is who's to say that a dead on 470k resistor will sound more pleasing in a circuit than a less accurate carbon film or carbon comp that measures 480K or 490K? 470K was used in the circuit in the first place because that is a standard resistor value but that doesn't mean it has to measure exactly that for the pedal to sound as good as it can. There are instances where accuracy is more important, for instance, a voltage divider which is used in many opamp circuits is designed to get exactly half the supply voltage (you may see this as vbias or vb on schematics). Accuracy here is important to get as close to exactly half the voltage as you can, and if the resistors differ in value too much then you may only get 4.3V or 4.7V instead of 4.5V. Same for LFOs where accuracy can help create exactly the sine wave you want. But that same accuracy isn't as important in the signal path or filters where drifted values may sound better (to you) anyway. Audible differences between components is another discussion altogether and again there are strong opinions on both sides about this. I'd just say use your ears and let them decide and to me that means I'd use what sounds best 10 times out of 10 no matter what the constituent material. I've made fantastic sounding effects with all types and will still happily use any of them. The output switch was just used to emulate the value differences found between the Meathead and Meathead dark. But looking at the highpass filter that is created with the volume pot, what you say makes sense. With just the 22n in circuit, the filter starts cutting lows at 14.5hZ, with the maximum 122n in circuit the lows are being cut at 2.6hZ. Both of these are a lower frequency than the lowest note on a guitar anyway, that's even too low for it to matter with a bass guitar. So swapping that cap isn't going to give you any sort of low boost, but you could swap things about for a post gain bass cut if you wanted to. 470pF in the centre position would make more sense as if would start cutting bass from 677hZ downwards, or maybe even 220pF for a lofi kind of effect. Then on one side leave the 47nF in place to give you a full bass output, and in the other position put in something like a 1n cap, which in parallel with the 220pF centre cap give you a cutoff from 261hZ downwards. Ahh ok so, I have some 470pf's around somewhere, Replace the 22n with that and replace the 100nf with a 1nf? Yes. The 220p would probably be a better choice though, a lo-fi effect gives you something a bit different. Give it a try with a 470p though, but you could put 2 x 470p caps in series to give you 235p if you don't have the 220p's. How easy/hard would it be do you think, to wire just one two way switch to flip between a stock and dark? Well based on when we were calculating the filters previously it would be pretty easy, because switching the output cap between 22nF and 100nF is pointless because it won't cut any more bass with the lower value cap anyway. The high pass filter created by the 22nF or 100nF cap with the 500K volume pot starts cutting bass below the lowest note possible on a guitar which is why you weren't hearing any differences switching the output cap until you swapped for the 220pF to give you a significant low end roll off. So in all honesty, if you want to create a Meathead / Meathead Dark switch you could do it by just switching the input caps. If you really felt you had to switch out both input and output caps for stock and dark values, then you could do it easily enough but you would need either a 2 position 4PDT switch to keep the caps tidy and mounted on the switch, or a DPDT with only a single cap lead connected to the switch, and the other lead floating and being connected in series with a connecting wire to the appropriate place on the board. 2. To box it in a 1590A is pure madness. I've used two cap configurations, so 2 DPDT On On had to be placed. Well, the box is just painted... finally. I've had to build the effect step by step inside the box, drilling the holes one by one after measuring every mm in order to fit a 3PDT, led, pot, two DPDT, two open jacks and a DC Jack. Sounds great in both positions, but If y have to choose one, no doubt the Dark is the best sounding for me. Well, here we have the pics. I'll need some time to even think about building another effect on a 1590A box, has been an extremely tight fit. Jacks once inserted are barely 2 mm apart from each other. One good thing is that I discovered it may be posible to fit veros of even 12x15 holes (if turned 90 degrees and with a more than careful measurement). Will have to try de Grease Box, Miro, but I'm falling deeply in love with the Meathead, is the first time I don't miss germanium trannies in a fuzz! Thank you dude! You won't regret if finally build this effect. Great fuzz with standard cap specs, and just incredible with the "Dark" ones. A must in every pedalboard! I was able today to try this effect at very high volume. It really rocks. I'm not sure why, selected trannies? resistors values? caps between B-B C-C? The whole circuit? I've tried loads of silicon fuzzes, and while some of them are great, no one sounds like this little beast. Just other note: I used DPDT for both input and output caps. On the output ones soldered a 22n and a 100n. That's true that the output cap seem to have no effect.... while the pot is at 12 o'clock and onwards, but is noticeable when de Dirt is at 7 to 11 o'clock, I would swear that there's a slight difference in bass response. Is this possible or is just my imagination? Fifth fuzz effect (2nd if we just count silicon ones) that stays on my side and is not sold. At the end of the day it's just an unversatile silicon Fuzz Face with only a volume control when all is said and done, and yet it sounds so much better than Fuzz Faces to me. It's the BC filter caps that makes this pedal so good IMO, they really smooth out the usual silicon spikes and do make it sound much more like a germanium pedal. If you like it you really should try all the other similar ones like the Drag'n'Fly, and Meathead Deluxe of course. Any difference in the bass content using the output switch is probably imaginary. One cuts bass starting at 3hhz, the other at 14.5hz and so both are well below the guitar's frequencies. Any differences are possibly due to non-linear response or other differing characteristics of the capacitors. If i was to disclose my biggest idol, it would most definitely be David. If anyone gets what i mean, his designs are all just in tact. Thank you mirosol! Cheers from Spain. Rudeez! You asked what transistors i used in mine. I opened it today (goddamn 3PDTs acting up) and checked - I used 2N5088 for Q1 and BC182L for Q2. tried it with BC182LA but the batch i got had really low hfe, dunno if they're meant to be that low but they were all in the 120 hfe area. also tried 2N2222A, sounded got but had a bit more fizziness to it. might do it with switchable caps to just to make it more versatile. although i love the fact that it only features one knob and sounds awesome. one problem tho, of all the f''ing resistors i have in my stash i havn't stashed 820R as well as 120K, 120 was easliy fixed by a 100+20 tho but that 820 i went on with two values that gave me 830, it can't be that much a differance really? next investments for the workbench, an expensive multimeter and a real dedicated hfe meter. what are the stock meathead Dark values? anyone know? I've made it "dark" with 33n fixed input and 27n output caps. The most extended opinion that you can find on the net (and the one I used and sounds great) is 470nF imput, 100nF output. But, if you ask me if there would be any audible difference between a 100nF and a 470nF in the signal input..... I'd dare to say that hardly if any. Hi i've just built it and it sounds Great!! i Can use it just a quarter...how can i resolve? By the way 15nf in the input is Killer!!! This will solve that problem..
Can I ommit the LED+? And hook one up following your offboard diagram instead? Yes no problem. I included it because it's a small layout and so plenty of room for the LED resistor on the board. But if you want to keep that offboard then as you say, follow the offboard diagram and you can also remove the 2K2 resistor and make the layout a column smaller. Personally I think it's much easier to have the resistor on the board and just have to take a wire to the LED rather than having a component inline somewhere, but for those who prefer that offboard it's no problem doing it that way. So I built this except I placed the caps directly on the board and omitted the switches. But the circuit is only producing a steady beat sound. Any ideas what happened? And I believe I used a 2N5088 as the second transistor. I got rid of the beating sound and fixed a few amateur mistakes I made but it still isn't working correctly. I can get a fuzz sound but my guitar has to be on 10 and I have to strum aggressively. And the sound it produces is really starved almost gated. 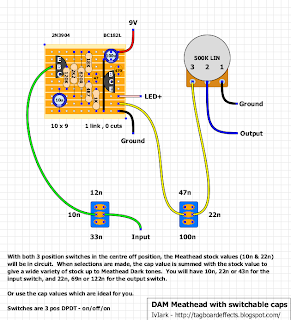 I'm thinking maybe 100uf cap should be lowered to 47uf that the other Meathead layout has. i seem to remember this beast having like infinite sustain. i'm getting a little bit of cut off after a few seconds of sustain... not too terrible like the death by audio circuits ive attempted. but ive tried numerous transistor combos of different gains from 300 to 650 am i just remembering this sustain incorrectly or could i have a problem. id say theres maybe 5 seconds of sustain then it peeters out. maybe someone has a good recommendation for q1 and q2 hfe's? My best attempts are with Q1 at around 300 and Q2 at just over half that. That gives me the best results. thanks, i tried that and it does sound good. But i still feel like i'm getting premature gating on the sustain. Am i just imagining that this circuit has tons of sustain? 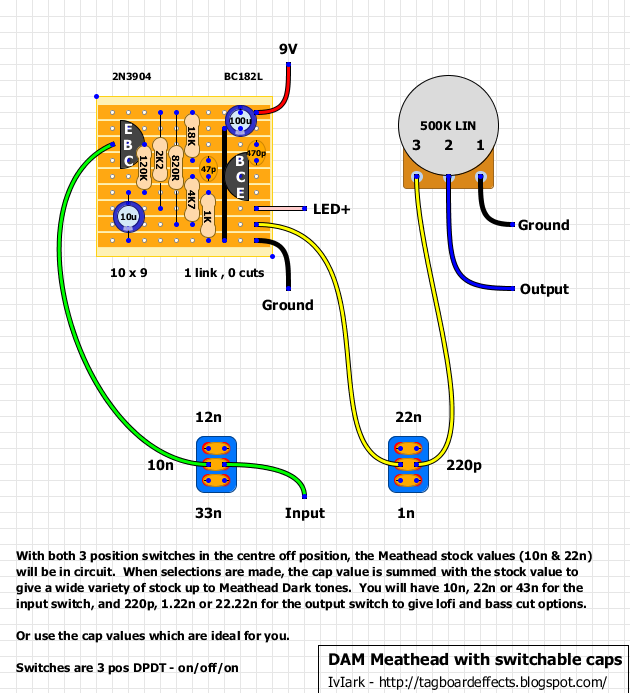 I find with this circuit that the 'standard' (10/22nf caps) gates like the coloursound one knob fuzz where as upping the caps to 47/100nf or anything up to 470nf for the output cap, solves the gating which is pretty much the dark version. Pickups play a part too. With my Seymour Duncan JB (high output) I get no gating but with my Pearly Gates (low output), It gates. thanks for the reply vince. i see that you made a 2nd post regarding resistors in the "recent comments" section on the side of the page, but I cant see it here now! I socketed every component to experiment and found that changing any resistor just made it sound gated or mis-biased. I think Dave from DAM must of tweaked it to perfection to be honest. The only 'decent' change was the 10uf, changing that seemed to VERY slighty smooth out the highs but nothing drastic enough to bother with imo. I have finished this pedal, but have no sound when the effect is engaged. I used my audio probe to see were the problem is occuring and the signal seems to stop at the first DPDT switch. The lug coming from the input has sound, but nothing from the lg going to the board. I resoldered the switch, and i changed the Cap aswell, but still no signal. Do you think it is a faulty switch? What do you guys think? I have also tried it with no cap on the middle lugs. Is there something that I am doing wrong? or do i have a faulty part? I am still having issues with the DPDT switches. Im beginning to think it is something I am doing wrong, as i have tried it with another switch, and the problem still occurs. Would this work with SPST switches, or do i have to use DPDT? If anyone can help I would greatly appreciate it. Hi Guys, I'm intending to build this one. Huge fan of DAM pedals. @JaviCAP, input cap for your "Dark" version is 390 or 470nF? I was in doubt 'cause you mentioned 390 first and than you corrected to 470 nF. By the way, anyone tried 2N5551 in any position (Q1 or Q2)? And finally, any good electronic component store on Ebay that sells in smaller quantities? Best regards for All! @Ivlark, your blog rocks! tomorrow will continue trying cap a and transistor combinations. one question: i used a 1/8watt metalfilm resistor (the 18k one). it was the unique i had, is there any problem? in this case tomorrow i'll desolder it and buy the classic 1/4 resistor. Thanks! 1/8W is fine for most of the resistors in these circuits, and definitely no problem with that 18K. I have a full set of them that I use for 3 hole spans when a 1/4W would need to be standing. The main ones you want to treat with caution are the very low value current limiting resistors in series with the supply. Great! in the next days i'll tell you the final resolution about the transistors and caps combinations case. so ive had trouble with this meathead layout for a while. ive been told that q1 should be higher gain than q2 for this circuit. but no matter what it try i get a mild gating effect when q1 has a higher gain than q2. this looks pretty similar to a silicon fuzz face to me, isnt the common approach having q2 higher than q1? Has anyone done/tried this for bass? Is it enough to just switch "darker" caps? Take a look at the post for the one knob fuzzes. I basically built the black arts toneworks version, ritual fuzz, which works great on bass. There's a few other changes besides input and output caps. But, theoretically by upping the input and output caps should make this more bass friendly. Btw, the ritual sounds pretty good on bass. question: can i use ON-OFF-ON toggle switch with resistors on ON`s but no resistor on OFF (middle position)? i want to add this switch in series to some resistor (100 K). when switch is OFF - the signal still comes through it? How would one go about adding a ZVex style pinch pot to this? I assume it's just a bias pot, but where do I put it? Thanks!